Arts Night 2013: An Extraordinary Evening! The weeks leading up to Arts Night go by in a hectic blur for everyone involved in pulling off this school-wide event. Transforming Cohn Campus into an art gallery, preparing and serving food for 800 people, and making sure the night runs smoothly all take months of planning and hard work. When I think of all of the effort put in by volunteers, teachers and staff, I can’t help but feel a sense of pride in our unique community. ISTP’s commitment to the arts is so incredible, and the dedication of the community to help elevate the students’ artwork is what makes ISTP extraordinary. Arts Night Food Chair Lisa Surwillo pauses to smile for the camera. Of course, none of this could possibly happen without volunteers. During weeks and days leading up to Arts Night, you could find our Arts Night Chair, Kristen Lèfevre, at school almost every day, ensuring that everything was going smoothly. 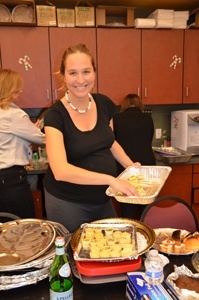 Our Food Chair, Lisa Surwillo, managed to feed the entire school with a smile on her face (from morning to night! Lisa is truly one of the easiest people to work with)! During the weeks before the big night, I often caught glimpses of what Aïcha and Haiying’s young artists were creating. Over the years, I have learned that no matter how much I try to envision the students’ finished art pieces, I will always be surprised by what I see when it all comes together. This, I think, is because a child’s imagination is boundless. Even if you catch a glance of their creativity at work, you will only see the whole of what a student envisions when they are ready to show you their creation. When all 580 of ISTP’s students finally showed us what their imaginations created, it made all of the planning and hard work worthwhile. With the help of Aïcha and Haiying, our young artists explored multiple artistic avenues, always incorporating ingenuity and creativity. As I looked at artwork hanging near the Media Hub, I thought I was seeing abstract mosaics made of newspaper clippings and bicycle reflectors. As I listened to a proud second grader tell her mom about her masterpiece, I learned that when you take a picture of the art with a flash, the reflectors illuminate luminescent fragments that form a design. It’s always wonderful to have a young child open your eyes to a new way of looking at the world. 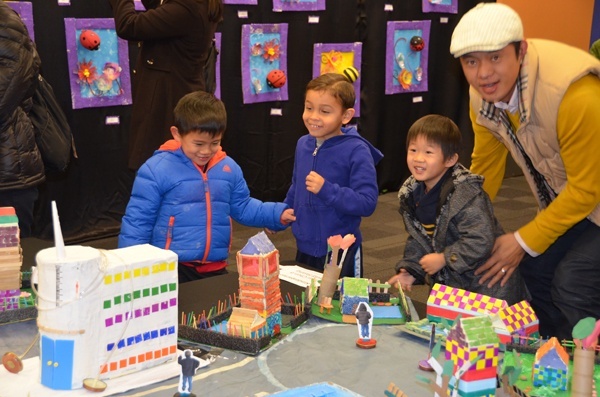 Students admire the village created by Yihui and David's class. The ways teachers incorporated their class’ artwork into their lessons was yet another impressive surprise. Melanie’s Pre-K class transformed hangers into charming fashionistas dressed in beautiful, colorful fabrics. The makeshift models’ Senegalese outfits were not chosen at random. Melanie used material from the country of origin (which is also her assistant Ndeye’s home) of her class’ pen pals to spark their excitement in exchanging letters with their new far-away friends. David and Yihui’s Kindergarteners made replicas of their houses and arranged them into a village, depicting the theme of community they are currently engaged with in class. The beauty of our ISTP teachers is that their projects are never designed in a vacuum. The students’ artwork was part of a larger objective to link creativity with the overarching subjects they’re exploring in class. 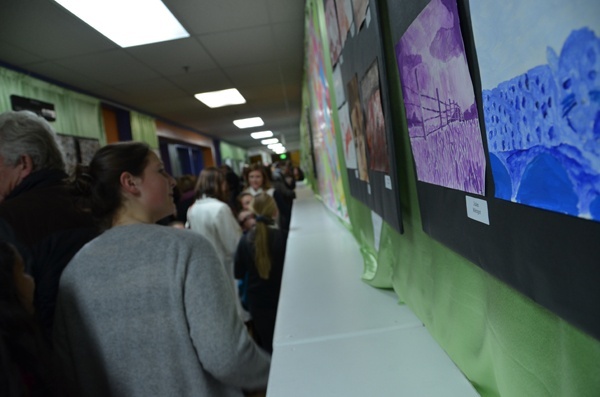 The Cohn Campus hallways were filled with admirers of our students' artwork. For ten years I’ve had the honor of facilitating the vision of our art teachers to create the wonder of Arts Night. My love for this event has always been seeing all of ISTP’s families together in one place, appreciating the hard work and joy of our bright students. As our school changes, grows and gets older, I find that each year introduces me to more reasons to love this inspiring evening. This Arts Night, the entire ISTP community really got to enjoy the renovations that our Phase 1 Expansion for Innovation donors made possible. The newly created Bean-O'Sullivan Media Hub allowed for all of the Cowper classes to be displayed in their own “mini-gallery” within the scope of the event. This allowed families to mingle and explore in a space that truly celebrated ISTP’s youngest artists. Having the Chueh-Shuen NanoWall open in the Rothschild Multi-Purpose Room allowed for the typically crowded space to feel more comfortable and navigable. Much like how our students’ art doesn’t exist in a vacuum, neither do the generations of students and parents who have, through the years, made ISTP their home. News of the renovations truly sparked their interest, and I was pleased to see so many Past Parents, Alumni, and even former Faculty! The Past Parents who had been instrumental in the original creation of the Cohn Campus (from mapping out the size and needs of the kitchen to creating the entire color scheme of the school) were delighted and pleased with all the changes we had made. These are people who, like you, are truly invested in the success of ISTP and are thrilled to see its growth and evolution. 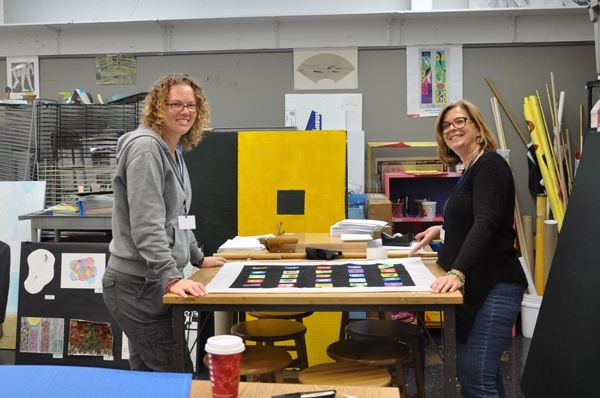 2013 Arts Night CHair, Kristin Lèfevre (left), assisted by parent volunteer and Trustee, Terri Kalia. Arts Night is our largest community event of the year, and the boundless dedication of the parents and teachers who make this evening possible is heartening. Every year, the Arts Night team sets out to create a wonderful evening that everyone loves, sacrificing weekends, and even losing sleep. Through it all, though, you will hear every teacher and volunteer say that seeing students’ joy in presenting their art to their families makes everything worth it. This year’s Arts Night Chair, Kristin Lefèvre, Food Chair, Lisa Surwillo, Art teachers Haiying Yang and Aïcha Idelcadi, the Cowper teachers, and their team of parent volunteers were no different. Without their dedication, we wouldn’t have, what I feel, is one of ISTP’s most compelling events.